The UCT Social Media online short course kept me busy for 9 weeks this year! I am very proud of the fact that I could complete it with a 70% mark! I can highly recommend the course as I have picked up more from it than I had expected! The course and course material was structured in such a way that it was easy to navigate. It is time-consuming, but at the end it is worth it! Any great courses you can recommend in social media? 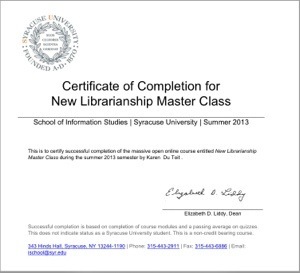 I have successfully completed the New Librarianship Master Class from the School of Information Studies at the Syracuse University. It was my first MOOC, and I am extremely satisfied with the quality and the content of this Massive Open Online Course. It has definitely opened up my eyes to a new paradigm in which to consider librarianship! I have just completed my first ever MOOC. It has been an interesting learning curve, both in doing an online course, as well as getting bombarded with “new thoughts” (new to me) in librarianship. I have done the New Librarianship Master Class presented by the School of Information Studies at the Syracuse University. I feel a bit overwhelmed by the thoughts and ideology surrounding New Librarianship, as explained in The Atlas of New Librarianship by R David Lankes. But the course has definitely opened up my thoughts and ideas about librarianship. It has given me tremendous hope for the future of librarians and libraries! – Librarians are not passive, but pro-active in their involvement of the community. – We are moving away from a lending model, towards a sharing model; where all the members of the community contribute towards a common goal through resources, information, goods, experience and skills. – We as librarians must model the positive change we want to see in our communities. It places a huge responsibility on our shoulders. – We are more than our collections, spaces and places. – We create the opportunity for new learning, new innovation and new creation! – We do not have to have all the skills, but need to be able to put the experts in contact with the rest of the community. It demands social networking skills. The future of librarianship is bright! If we do not have an ideology (with a good theoretical framework) to address the future of libraries and librarians, we would not be able to take our profession into an exciting future! I am inspired! Thanks to R. David Lankes!